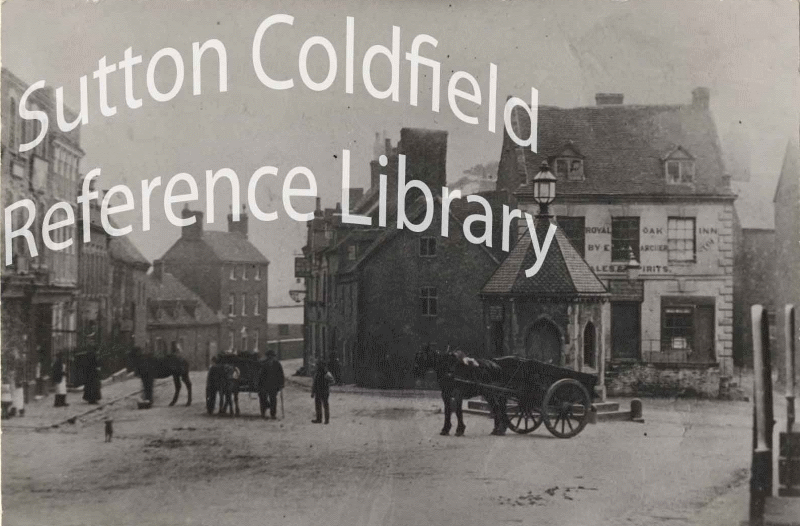 The old town hall, which stood at the junction of High Street, Mill Street and Coleshill Street, was demolished in 1854, and the weighbridge, with its “pepper pot” office, was installed in 1859. The Corporation accounts for 1859 show that that year John Hill was paid £135 for the cost of the weighing machine at the top of Mill Street, and Joseph Neale was appointed to be in charge of it at 25s. per quarter. A weighbridge is a very large set of balance scales consisting of a large metal plate set into the road surface with a small hut beside it containing the scale. (The first practical machines of this type were invented by John Wyatt of Birmingham in the 1740s). The Sutton public weighbridge, situated on the site of the weekly Monday livestock market, was used for weighing livestock as well as horse drawn carts and wagons. The conduct of the Warden and Society of Sutton had been the subject of a long court case in the Court of Chancery. This resulted in a scheme, implemented in 1824, which specified how the Corporation’s funds were to be applied. This scheme was first proposed in 1817, clause 20 reads - “The Warden and Society being enjoined by the Charter to see that the weights and measures are just within the parish it is hoped that a sufficient sum should be allowed for a weighing machine for the use and benefit of the poor inhabitants and for a salary for a person to attend on the same”. The cost was given as £173. 14s. 0d; with an annual salary of £5. The Pepper Pot was a distinctive Sutton landmark for nearly fifty years, but by 1900 it stood in the way of progress; in 1901 the weighbridge was moved to the council yard in Riland Road. The Pepper Pot with its gas lamp was removed, to be replaced by Sutton’s first electric street light. The Pepper Pot looking towards Coleshill Street c.1880. The gable end of Joseph Neale’s house is in the centre of the photograph, the weighbridge is the dark smudge in the road in front of the horse.